black and white thungs and the common man in swinging 1930's Harlem. “Jitterbug!” is based on thoroughly researched facts about an eye-opening almost forgotten period in black entertainment history and pop culture over 80-years-ago. This “radio” play is the shortened version of the full-length play and screenplay that weaves a fictional love story and dance contest between actual events, people, and the language of the time. It begins in 1931 when Billy Rhythm, a dancer and the quintessential American, returns to Harlem having failed to make it on the T.O.B.A (Theatre Owners Booking Association) circuit, the black man’s vaudeville. 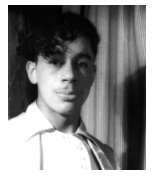 That year was chosen because it marks a pivotal event that led to one of those very rare moments in history which we look back on as magical: Cab Calloway replaced Duke Ellington at the Cotton Club. Niggers, kikes, and micks, oh, my! Not very PC, but that's how America saw itself back then. It's been a long and winding yellow brick road ever since to get to where we are today and much of it began in Harlem. Where else could a young unknown band leader (Cab was 22-years-old) and his equally young and unknown band (The Missourians) have set the world on fire when they teamed up with two young Jewish songwriters working for the mob in a small nightclub in Harlem. Prohibition, then 10-years running, brought people of all colors and faiths together to make music and money, and to drink away the Great Depression-- the second great event that propels this story along: it brought Billy back to Harlem broke and looking for a job. Bill "Bojangles" Robinson shows how it's done. After getting beaten and thrown out of the Jolly Fellows by its leader Herbert "Whitey" White for abandoning them to chase his dreams on the TOBA circuit and then returning in disgrace, Billy suffers through a few more beatings and rejections until he tracks down Bill "Bojangles" Robinson shooting a game of pool in the storied and infamous Comedy Club, a front for gambling and illegal booze. It also happens to be the Jolly Fellows clubhouse. This legendary gang controlled everything between 134 and 135th streets and was known for its toughness-- and its dancers. Bojangles at this time is 50-years-old and unknown outside of New York-- but feared and respected in Harlem where he's affectionately known by Harlemites as their "Mayor." Impressed by Billy's bravery for showing his face in the club but annoyed by his signifying brashness, Bojangles challenges him to "trade fours" to see if he's as good as he says he is. Before Billy knows what's happening, Jolly Fellows have pushed him through the doorway into a small back room where an upright piano is shoved up against a wall. This is the fabled Hoofers Club, "the unacknowledged world headquarters of tap dancing." It's where the greats come to practice and exchange-- steal -- steps. Bojangles orders a kid at the piano to lay down some "stop time" and within seconds Billy is trading steps with the greatest tap dancer that ever lived. Although he holds his own for a while-- even the Jolly Fellows are impressed-- Bojangles puts him away with a series of steps no one can duplicate. Still, Billy earns Bojangles' respect enough to stop the Jolly Fellows from killing him-- and gives him a lead on a gig at the Cotton Club. 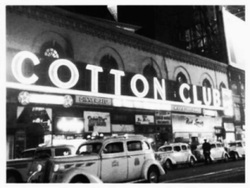 Billy auditions for Cab and Harold Arlen at the Cotton Club as if a man possessed. It works-- despite reservations from mobster co-owners Big Frenchy DeMange and Harold Block. 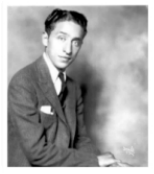 In the radio version,* Harold Arlen (who eight years later will write the music for The Wizard of Oz) is racing to rehearse the club’s next show Rhyth-mania only days away from opening. Although the songwriter and the mobsters are very minor characters in this story, their influence permeates everything since the songwriter is providing the music for a dance contest which sets into motion a confrontation between the club’s entries (Billy and his sweetheart Tharbis Jefferson) and contestants from Billy’s ex-gang the Jolly Fellows who will stop at nothing to win-- including murder. The play’s dependency on music from that period is especially apparent in the radio version but not using it in any version bleeds the story of its authenticity— and magic. The music also reminds us that even when Jim Crow laws and racism were institutionalized and the Great Depression and Prohibition were grinding down the American spirit, art and beauty could still find a way of taking root thanks, in part, to the black and white lawbreakers, musicmakers, poets and dancers who, when they came together out of sheer desperation and greed, unknowingly were contributing to the Great American Song Book and making Harlem America's most mythic city. This underlying theme can be heard in nearly every song-- and seen in every dance move. The 1936 hit You Can’t Live In Harlem, written by a couple of “nice Jewish boys” not associated with the Cotton Club-- but performed by African Americans-- is a great and rousing example of this symbiotic relationship born in one of America’s darkest moments. It is a fittingly appropriate beginning because it offers up the opportunity to provide musical bookends to the story. If the play begins in collaboration with a song about Harlem, it also ends in collaboration, coming full-circle 33-years later, this time with Duke Ellington composing Harlem, an experimental symphonic piece he recorded with his band and some of Europe’s best symphony orchestras. 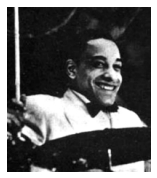 It shows the evolution of the big band sound and serves as a great tone poem for the play’s magical stand-up-and-cheer finale at the Savoy Ballroom.